Epitomizing good taste and charm, Sherwood House Vineyards is one of Long Island’s most exquisite boutique wineries. Owner Barbara Smithen, along with her late husband Dr. Charles Smithen, believe that producing fine wine is a combination of passion and patience, handcrafting their wines using traditional methods combined with the latest scientific techniques. Sherwood House Vineyards believes that making great wine requires both science and art. And while science can be learned by anyone, the near-intuitive understanding of crafting the art is what makes all the difference in the wine. Established in 1996, Sherwood House Vineyards is committed to the production of world-class wines using only estate-grown vinifera grapes. The Smithen's initially planted Chardonnay vines from Burgundian clones, but after careful research and planning, have since added Merlot, Cabernet Sauvignon, Cabernet Franc, and Petit Verdot. Sherwood House currently produces a Stainless Steel Fermented (un-oaked) Chardonnay, Barrel Fermented (oaked) Chardonnay, Blanc de Blanc (sparkling), White Merlot, Merlot, Cabernet Franc, and a Bordeaux-style red blend. 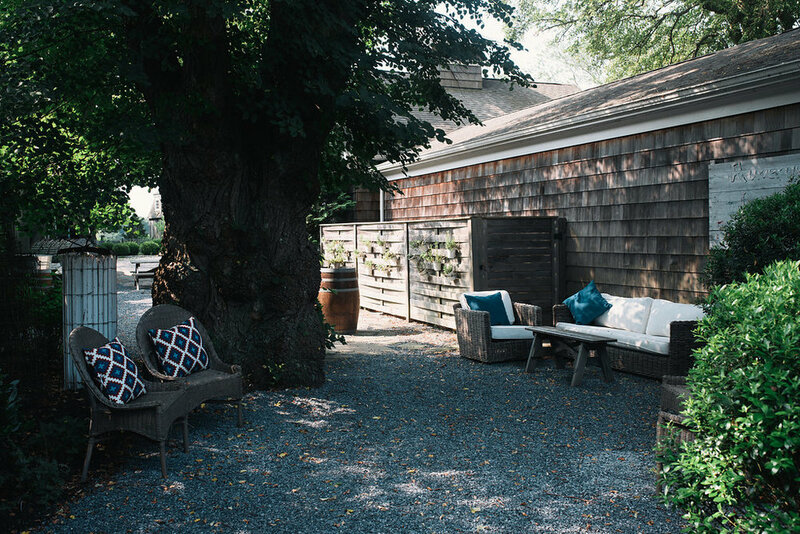 Since selling her Mattituck farm, Barbara Smithen continues to purchase grapes exclusively from the property’s new owner in order to maintain the same quality and characteristics that Sherwood House has come to be known for. Gilles Martin, Sherwood’s winemaker since inception, is responsible for firmly cementing Sherwood House Vineyards as one of the premier producers both on Long Island and internationally. 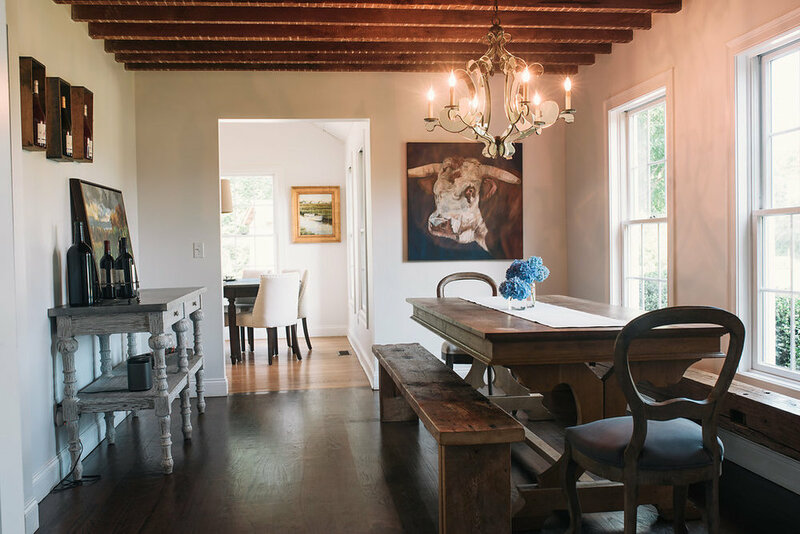 Sherwood's tasting room is a beautifully renovated 1870’s farmhouse, once lived in by the Tuthill family, some of the North Fork’s earliest settlers. Built and decorated with all reclaimed wood material, much of it from local sources, the charming tasting room exudes rustic elegance. Much like the wine itself, Sherwood’s tasting room is unique and one of a kind. *Flights and bottles stop being served one hour prior to closing. *Glasses stop being served 30 minutes prior to closing. To make a reservation please contact reservations@sherwoodhousevineyards.com or call 631-779-2817. For parties of 6 or more, we require a reservation in advance. If possible, Sherwood will work to seat walk-ups but priority will be given to groups who have made a reservation. We can not guarantee space for walk-up groups of 6 or more. We do not accept reservations for parties over 16. We accept reservations between 11:00 AM and 4:00 PM, Monday through Friday, and 11:00 AM to 4:00 PM, Saturday and Sunday. Outside food is not permitted. Cheese boxes and North Fork potato chips are available for purchase in the tasting room. Service dogs are permitted in the tasting room, all other leashed dogs are welcome outside only. Sherwood House allows buses or limos between the hours of 11:00 AM and 2:00 PM. Parties arriving by bus or limo are required to make a reservation in advance. Buses and limos are not allowed to park on site, but will be directed to park at a local lot. 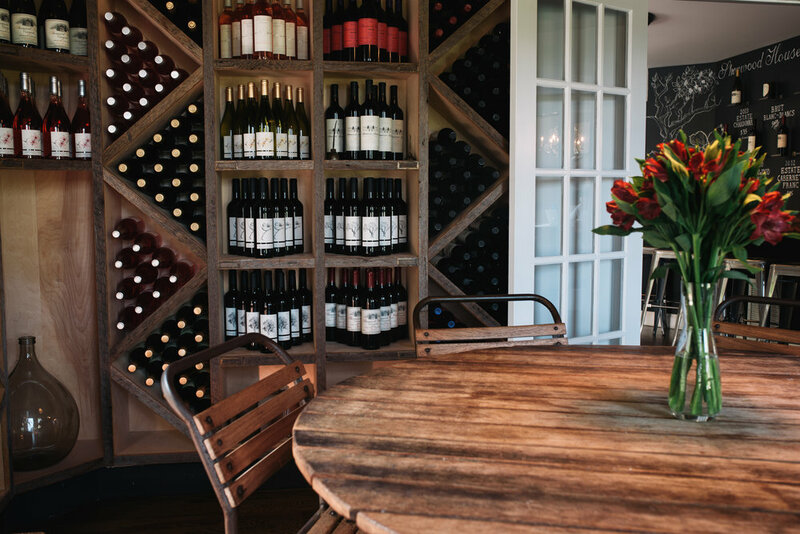 For parties of 16 or more, please contact us at reservations@sherwoodhousevineyards.com or 631-779-2817 for more information and availability about private events.